When I learned The Last Supper Club (TLSC) was morphing into Beretta, I was a little peeved. I liked TLSC’s pasta, good wine list, and convivial party vibe. One sweet touch TLSC had was to include a pesto for each table’s bread basket, which always tasted better than plain butter or olive oil. I needn’t have worried. The new restaurant, Beretta, still has a fun setting, interesting Italian food, with smashing drinks and affordable yet good wines. Dare yourself to try Beretta’s specialty cocktails, with ingredients like Benedictine, tia maria, absinthe and Dubonnet. The improved whisky cocktail is potent and balanced, with rye, bitters, dubonnet, absinthe and a touch of maraschino. Think smooth and sharp. Wine by the bottle is an affordable and pleasing pairing with food, and decent bottles can be had in the thirty dollar range. Beretta’s Italian food is skillfully prepared, and the cheery and hip wait staff does a great job at pacing. Highlights included a mixed meat antipasti platter with lardo, which is white fat from the back of a pig, peppery soprassata, and artisan salumi with giardiniera, otherwise known as pickled carrots and cauliflower. The arugula & fennel salad with shaved parmesan, also pictured above, is tender greens with a nutty flavor. Pizzas are a specialty, and are of the blistery thin type. Winning flavor combinations include: potato, rosemary, radicchio & gorgonzola; and prosciutto, tomato, arugula & mozzarella. It would be nice if the arugula was slightly more wilted, but that is a small quibble. "This is a funeral," one chef instructor told me. "I wore black," he added. We were mourning the last buffet dinner at the historic Careme Room at the California Culinary Academy, in San Francisco. The Polk Street campus will close this summer, after decades of food, learning, and enjoyment for culinary students and the public alike. The building is over one hundred years old, and used to be a German social club, bowling alley, and performance venue for Jimi Hendrix, the Beatles, and Janis Joplin. The occasion felt mostly happy, perhaps due to an open bar and generous wine and champagne pours at the tables. There were lots of hugs and folks reuniting and catching up. All guests were comped for the event, which seemed like a nice gesture. I've heard that the price to attend the CCA is now over sixty thousand dollars and that enrollment is down, which is one reason the Polk campus is closing. My thirty five thousand dollar culinary education now sounds like a relative bargain compared to that steeper cost. It would've been fun to see more fellow CCA alums in attendance. Guests included: Julie Tan, Roy Salazar, Herve LeBiavant, Serge Bled, CCA President Jennifer White, Tim Grable, Mike Weller, Chef Leo (recently retired after teaching eight thousand students! ), Stephen Gibbs and Molly Fuller, Holly & Jean Yves LeDu, Emily Adams, Francesca Perata, Larry Michaels, Michael & Rose Rech, uber food blogger Amy Sherman (who had returned from a trip to Italy that afternoon), Beth Klein Seligman. Invites were sent out only seven days before the event, and what cook is able to escape work on a busy Friday night on a holiday weekend? Buffets were set up, but the room only seemed to have a third of its usual buffet contents. There seemed to be too much pates and meat, with a smidgen of Ceasar and fruit salads. I looked for endive appetizers, which were a buffet standby when I was a student. No go. The menu: charcuterie, assorted smoked meats and fish, gallontines, ballotines, assorted pate and salads, fresh (moldy tasting) seafood selection, cheeses and fruits, hot entrees including prime rib, kobe beef, and trout. Desserts were flaming crepes, giant flaming Baked Alaska, chocolate and cheesecakes, and mini fruity/creamy pastries. Perhaps the best part was watching the teen aged daughter of Larry Michaels easily slice off the cork of a champagne. Chef Herve LeBiavant had a bigger sword, and took three tries. Next came the flaming Baked Alaska, which looked more than thirty feet long. Uses: Cumin can be used to season many dishes, as it draws out their natural sweetness. Uses: Fresh ginger is one of the main spices used for making pulse and lentil curries and other vegetable preparations. Uses: Cassia is a close relative to the cinnamon, and has an intense flavor and aroma to desserts, baked goods, curries and meats. Uses: Gives food a rich, golden yellow hue and has a taste reminiscent of metallic honey with grassy or hay-like notes. Uses: The hard green pulp of a young fruit is very tart and acidic and is most often used as a component of savory dishes. The ripened fruit is sweeter, yet still distinctively sour, and can be used in desserts and sweetened drinks, or as a snack. Uses: Has a characteristic pungent, spicy flavor that mellows and sweetens considerably with cooking. Eating at San Mateo's Little Sichuan Restaurant can be a hot, hot, hot experience. 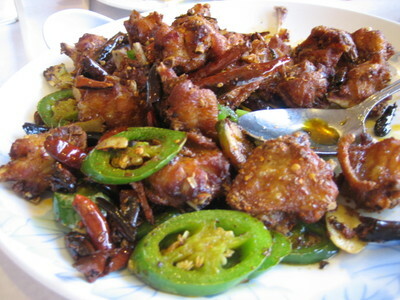 The dry fried chicken, shown here, and Ma Po Tofu (pictured below) were almost too much. Yet it was tasty, hearty, and good. Combining jalapenos and Sichuan dried chilies offered potent heat. There was also a pleasant hint of sweetness with the chicken that helped balance the spicy seasoning. We specified that the food be hot spice wise, and Little Sichuan delivered. I noticed other chile eaters sweating and smiling. Many had Chinese beer, tea, and water. On some tables, there were bowls of broth with red chile oil or liquid on top that intrigued. Worth another visit. Others may complain about the service, which can be spotty. On weekday lunch visits the service isn't always consistently good. Also, the restaurant has a worn feel. But I'm not going for decor or service. The spicy food with ample servings over rules these quibbles.